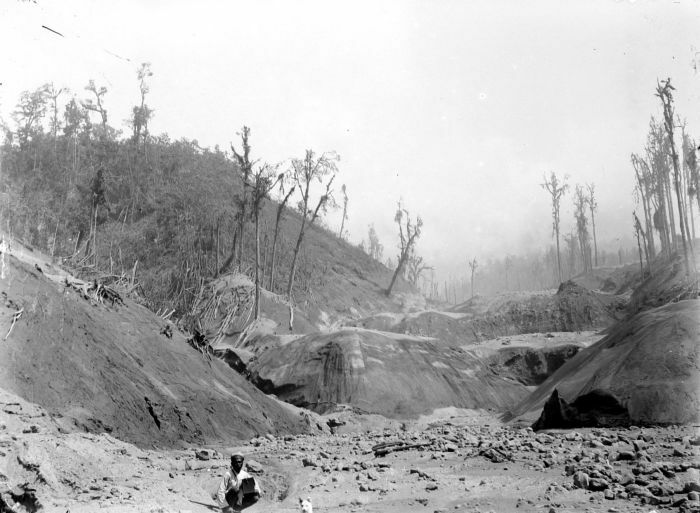 In May 1919 the Kelud volcano erupted. The volcano, located on the island of Java, was then part of the Dutch East Indies colony. Kelud’s eruption devastated the nearby town of Blitar and several smaller villages, killing at least 5.000 people, and displacing many more. It was, however, neither the first nor the most destructive natural disaster during the Dutch rule in the archipelago. The iconic 1883 Krakatau eruption, for instance, killed over 36.000 people. Yet the Kelud eruption aptly illustrates the dynamics of disaster relief in the early decades of the twentieth century on three levels: local/colonial, between colony and metropolis, and international. In the immediate aftermath of the eruption, local authorities and private groups and individuals scrambled to provide emergency medical aid, food and shelter to the stricken population. As was usual at the time, local notables formed a relief committee, which was financially supported by a system of colony-wide, locally organized relief funds consisting of European high-ranking civil servants, businessmen, press and members of the indigenous, Arab and Chinese communities. Most funds were ultimately centralized in the Surabaya-based ‘Kelud Fund’ or the so-called Semeru Fund (Smeroefonds), which had been created in 1911 as a continuation of the relief fund set up after the eruption of the Semeru volcano (Java) in 1909. The donations were then forwarded to Blitar for reconstruction and compensation of victims. In total, some fl 1.500.000 were raised. Devastations at volcano Semeru, between 1907 and 1931 (Tropenmuseum, part of the National Museum of World Cultures). By Tropenmuseum, part of the National Museum of World Cultures [CC BY-SA 3.0], via Wikimedia Commons. The disaster led to the creation of not only European-led, but also separate Indonesian-Chinese (which later merged) and indigenous fundraising committees. The indigenous committees were initiated by the nationalist Sarekat Islam (Islamic Union) movement and consisted of cooperation between nearly two dozen indigenous associations, with the explicit goal of improving indigenous solidarity and nationalist spirit. While the amount of money raised by the committees was relatively low compared to its European counter-part, it illustrates a trend toward expressions of indigenous nationalism through charity that could be seen in other colonies as well, such as British India and French Indochina. Through the late colonial period, the colonial government held to the position that while it was responsible for providing emergency aid, the money for compensations and material recovery should come from society. This gave space to private charity to step in to fill this void and stimulated involvement of civil society organisations. Significant donations were made to and by the above mentioned Semeru Fund. Its official aim, according to its statutes, was “to offer from it aid without delay in case of disasters, which strike the population, or part of the population of the Netherlands Indies, regardless of ethnicity (landaard).” Its capital came primarily from private donations, rather than government subsidies. It served this function for a number of major disasters, including major earthquakes and volcanic disasters, as well as several floods and storms in the Netherlands. It collected and distributed nearly fl. 2.000.000 over 28 years, through local aid committees and administrators. The Semeru Fund also maintained ties with the Dutch Oranje Kruis (Orange Cross) organisation, which was the primary Dutch disaster relief organisation in the early 20th century. Their cooperation consisted of mutual fundraising and prompt sending of emergency funds: if a disaster occurred in the colony, the Oranje Kruis would send funds and organise fundraisers in the Netherlands and vice versa. For the Kelud disaster, the Oranje Kruis initiated a fundraising committee organised through the Ministry of Colonies that held fundraisers and donation drivers throughout the Netherlands. Although a construct of this particular kind appears to have been unique to the Dutch colony, relief for disasters and famine victims was commonplace in other European colonies in Asia as well, most notably India. There, from the nineteenth century onward severe famines, killing millions, sparked a variety of civil society initiatives for relief. The same was true for major earthquakes in the 1930s in Bihar and Quetta. As was common for the time, the Kelud eruption prompted international donations as well, in particular from places with which the Netherlands (East Indies) had close ties: Singapore, Shanghai, Hong Kong, Nagasaki, Washington, and Bangkok. While these donations were small, they illustrate that the structure of international disaster relief aid was commonly based on formal and informal relations between nations and non-governmental transnational networks, rather than on an international humanitarian coordinating body like the International Committee of the Red Cross (ICRC). In the early 1900s, particularly after World War I, international humanitarianism and Red Cross work did expand beyond aid to victims of war, to aid civilian populations needing health care and in famines. International disaster relief in the early twentieth century was a foreign and colonial policy tool as much as an expression of empathy. An attempt to structurally integrate relief for victims of natural disasters into international humanitarianism failed however in the 1920s and 1930s. In the early 1930s, after protracted negotiations, the International Relief Union (Union Internationale de Secours) was created at the instigation of Giovanni Ciraolo, president of the Italian Red Cross, who sought to create such a body after witnessing the destruction wrought by the earthquake in Messina, Italy in 1908. The IRU was never effective at the primary task envisioned for it by Ciraolo. Feuding between the ICRC, the League of Red Cross Societies and the League of Nations, as well as nation governments and the American and British Red Cross Societies led it to be founded as an underfunded organisation that was unable to fulfil the original tasks envisioned by Ciraolo. The entry is based on archival material and colonial newspapers as well as on secondary literature. The following readings give an impression of the value of studying the entangled histories of colonialism, humanitarianism and natural disasters. The article by Bernice de Jong Boers and Simon Winchester’s book are studies on major volcanic eruptions in Indonesian history. The texts by Schrikker, Tirthankar and Nguyen-Marshall focus disasters, charity and state relief in the colonial settings of Indonesia, India and Indochina. Hutchinson’s articles outline the (failed) attempt to integrate natural disasters into the international humanitarian system. Jong Boers, Bernice de. ‘Mount Tambora in 1815: A Volcanic Eruption in Indonesia and its Aftermath’. “Indonesia” No. 60 (1995): pp. 37-60. Hutchinson, John F. ‘Disasters and the International Order: Earthquakes, Humanitarians, and the Ciraolo Project’. The International History Review 22, no. 1 (2000): pp. 1-36. Hutchinson, John F. ‘Disasters and the international order – II: the International Relief Union’. The International History Review 23, no. 2 (2001): pp. 253-298. Tirthankar, Roy. Natural Disasters and Indian History (New Delhi: Oxford University Press, 2012). Nguyen-Marshall, Van. In Search of Moral Authority: The Discourse on Poverty, Poor Relief, and Charity in French Colonial Vietnam (New York: Lang, 2008). Schrikker, Alicia. ‘Disaster management and colonialism in the Indonesian archipelago, 1840-1920’. In: Natural Hazards and People in the Indian Ocean World, edited by Greg Bankoff and Joseph Christensen (forthcoming 2016). Winchester, Simon. “Krakatoa: The Day the World Exploded” (London: Penguin, 2004). Sander Tetteroo obtained his B.A. and Research M.A. degrees from Leiden University, graduating in Colonial and Global History. He is a PhD candidate in the joint program between Leiden University (Netherlands) and Universitas Gadjah Mada (Indonesia). His project is on “Humanitarianism and Religion: Philanthropy in Colonial and Postcolonial Indonesia in Response to Calamities (c. 1890-1965)”. His research interests are in the histories of poverty, famine and disaster, humanitarianism and victimhood and colonial policy-making. Sander was a participant of the Global Humanitarianism Research Academy (GHRA) 2015. Citation: Sander Tetteroo. ‘Java, 1919: Colonial Disaster Relief’, in Online Atlas on the History of Humanitarianism and Human Rights, edited by Fabian Klose, Marc Palen, Johannes Paulmann, and Andrew Thompson, 2015-12, urn:nbn:de:0159-2016090577 [2019-04-26].